Chinese President Xi Jinping shakes hands with Taiwan's President Ma Ying-jeou during a summit in Singapore November 7, 2015. The leaders of Taiwan and China began historic face-to-face talks in Singapore Saturday. It is the first such meeting between the two leaders in more than 60 years. Scores of reporters crowded into the ballroom of Singapore’s Shangri-la Hotel where the two shook hands and smiled. According to China’s state broadcaster, the handshake lasted for one minute and 10 seconds. Taiwan and China split amid a civil war in 1949. Since that time, communist-ruled China has remained a one-party state, while Taiwan has developed into a vibrant democracy. China claims that Taiwan is part of its own territory and wants the two sides to reunify, but support for unification in Taiwan is very low. President Ma Ying-jeou highlighted the need to continue to deepen dialogue and ties, noting what he called the successes of his term in office. “We follow different political systems, and it has taken time to transition from military confrontation to cooperation and dialogue,” Ma said. Ma’s remarks included five suggestions for the peaceful development of relations between the two sides, including the need to establish hotlines and the establishment of institutions to create what he called win-win cooperation. In Taiwan, angry protesters tried to storm parliament in Taipei as Ma left for the historic meeting. Police stopped them and there were no immediate reports of arrests. Several demonstrators remained at the scene, staging a sit-in early Saturday. Protesters also gathered at Taipei's airport where Ma spoke to reporters before departing for the meeting. China claims democratically ruled Taiwan is part of its own territory and wants the two to reunify. However, support for unification with China in Taiwan is extremely low. 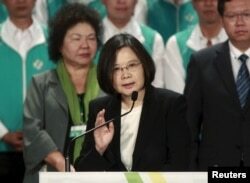 Democratic Progressive Party Chairwoman Tsai Ing-wen, who also is the party’s candidate in the upcoming presidential race, said she, like many others, was surprised by the announcement. A spokesman for Ma said no private agreements will be signed during the talks and stressed that the talks aim to solidify relations between the two sides and “keep the status quo across the Taiwan Strait." 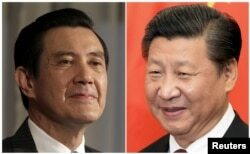 This combination of file photos shows Taiwan President Ma Ying-jeou, left, and Chinese President Xi Jinping. The governments of Taiwan and China do not recognize each other and working out some agreement about how the two should address one another has long been a stumbling block to such high-level talks. After holding brief talks in the afternoon, the two will hold separate press conferences and dine together in the evening. Relations between Taiwan and China have bloomed during Ma’s tenure, but so has public concern — especially among younger voters — about the island’s over-reliance on China. Since coming to office, Ma has worked to sign 23 cross-strait trade agreements. But even as its trade and tourism ties have grown during Ma's time in office, Taiwan’s economy has continued to struggle and there have been growing questions about just how much the island is benefiting from closer engagement with China. An effort to push a Cross-Strait Service Trade Agreement through the legislature without a clause-by-clause review was met with strong opposition last year, when young protesters occupied Taiwan’s Legislative Yuan. How the meeting could impact the elections was not immediately clear. Bruce Jacobs, an emeritus professor at Monash University in Australia, said the meeting is unlikely to have too much of an impact. “If anything, it could work to Tsai’s advantage,” he said, referring to the opposition DPP’s presidential candidate, Tsai Ing-wen. Another, and perhaps more interesting question, Jacobs added, is why is President Xi meeting with Ma now? FILE - Taiwan's main opposition Democratic Progressive Party (DPP) Chairperson Tsai Ing-wen gives a speech at a party congress in Taoyuan, northern Taiwan, Sept. 19, 2015. Chinese state media underscored news of the talks throughout the day, highlighting that Singapore was the same location where representatives of the Nationalist and Communist Party held their first talks in 1992. Reports also emphasized how relations between Taiwan and China have improved since Ma stepped into office, but little mention was made of the challenges and Ma's lagging popularity. Eric Chu, the Nationalist Party’s presidential candidate, echoed China’s position about the meeting, saying the talks would be an important milestone for cross-strait relations. In the United States, White House spokesman John Earnest welcomed the news. "The fundamental interest of the United States is in a stable and peaceful cross-strait relationship," Earnest said during a regular briefing. "But, you know, we'll have to see what actually comes out of the meeting." Ma’s Nationalist Party fled China to Taiwan after losing a civil war to Mao Zedong's communists in 1949. In Taiwan, the party ruled the island with an iron fist for decades, silencing dissidents, much like the Communist Party does in China. But unlike China, Taiwan gradually opened up, allowing for opposition parties. The island held its first democratic elections in 1996.